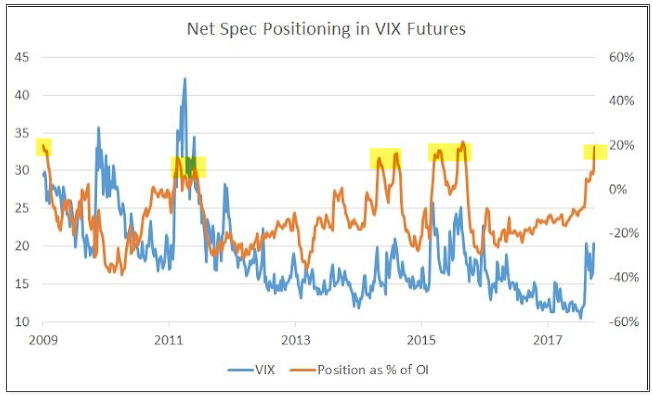 1.Speculators Now Net Long the VIX in Size. Speculators are now positioned net long Vix futures to a near record extent (orange line). In the past decade, that has reliably coincided with at least a near term top in volatility (blue line; from Movement Capital). The first quarter earnings season begins today. With the stock market struggling lately, there seem to be a lot of bulls hanging their hopes on earnings strength to help pull the market out of correction territory. From a seasonal perspective, stocks don’t typically react all that great to their first quarter earnings reports. Using our Earnings Screener tool, we can see how stocks typically react to earnings reports by quarter. 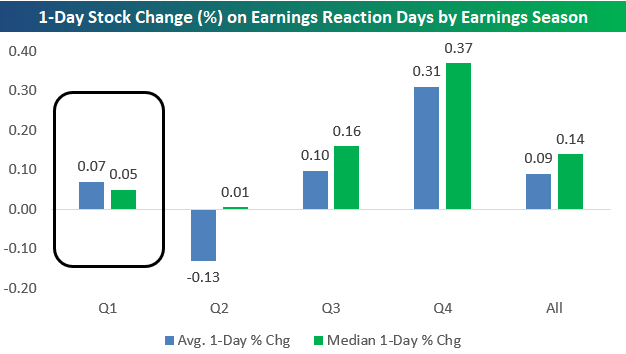 Historically, the average stock has gained 0.07% on its earnings reaction day during the first quarter earnings season. That’s the second worst quarter behind only the second quarter reporting period. The best earnings season for stock prices is Q4, when the average stock gains 0.31% on its earnings reaction day. This held true last season when the average stock gained 0.45%. Over the last five years, the average stock that has reported earnings has gained or lost 5.43% on its earnings reaction day. 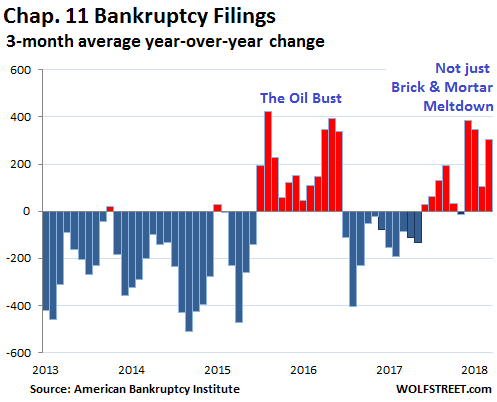 That’s a huge move for investors to deal with once every three months. Below we have broken out the average daily move for stocks reporting earnings by sector. 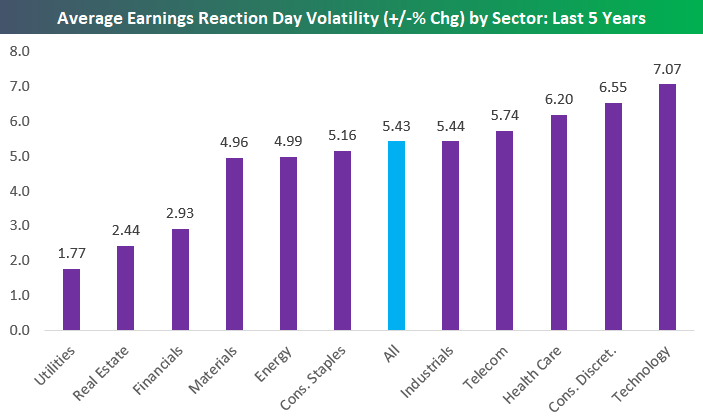 As expected, Utilities stocks experience the least amount of volatility in reaction to their earnings reports. Notably, though, Financial stocks are the third least volatile in reaction to earnings with an average one-day move of +/-2.93%. The remaining sectors all experience average moves of roughly +/-5% or more. 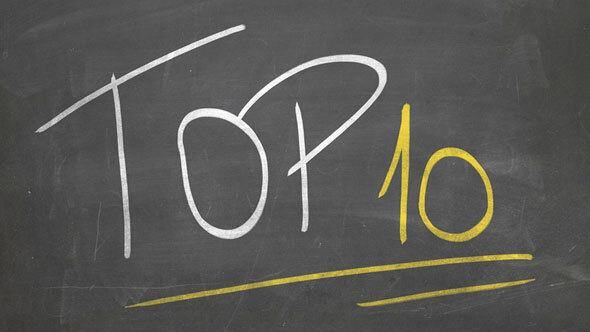 At the high end of the list is Technology. As shown, the average Tech stock moves +/-7.07% on its earnings reaction day. Consumer Discretionary stocks are the second most volatile to earnings with an average absolute move of 6.55%. Health Care ranks third at +/-6.2%, followed by Telecom and Industrials. 3.Important Earnings Season as Expectations are High. 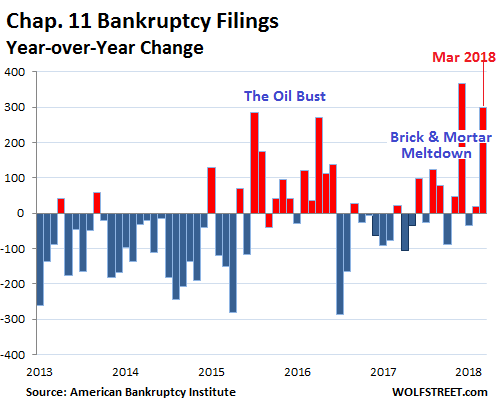 However, while this season is expected to represent one of the strongest for Wall Street in years, in terms of growth rates for both earnings and revenue, the anticipation that has been building ahead of the releases may itself represent a risk to markets. 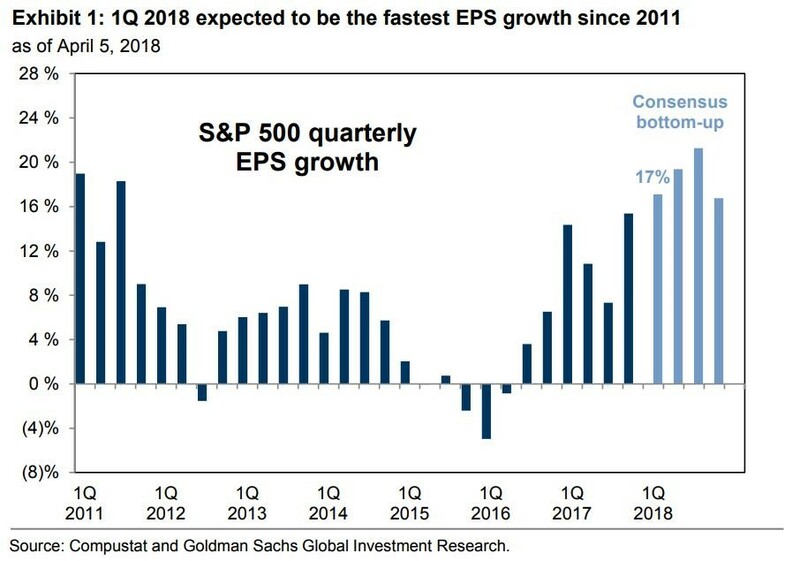 According to FactSet, earnings for companies in the S&P 500 SPX, +0.33% are expected to grow 17.3% in the first quarter, while sales grow 10%. For both, such rates would represent the fastest pace of growth since the first quarter of 2011. Earnings expectations have been rising of late; at the end of December, analysts were expecting growth of 11.4%. 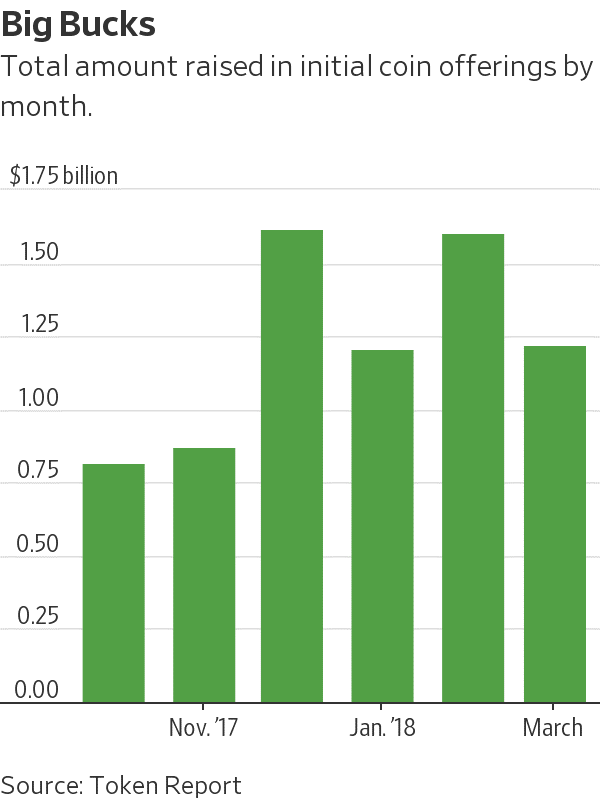 Much of that increase was due to the recently passed tax-reform bill, which sharply cut corporate-tax rates; Goldman Sachs estimated that if you exclude the impact of the tax bill, earnings growth would come in at 9% this quarter. 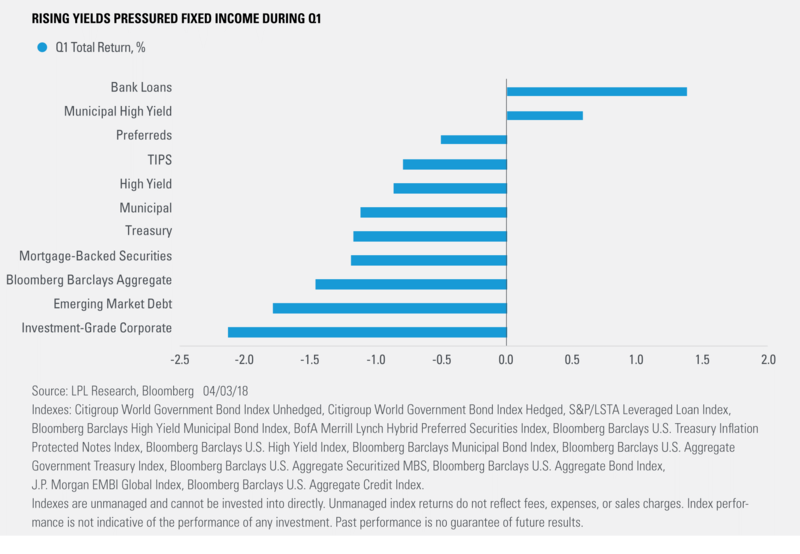 4.Q1 Fixed Income Negative Returns. As a broker, Coinbase’s platform would only be allowed to offer tokens that comply with securities laws. That would mean token issuers would have to register their sale with the SEC, providing investors with an extensive set of financial disclosures. Token issuers can avoid those disclosures if they limit the sale to institutions and millionaires, but investors in such private sales aren’t immediately allowed to sell the investments. At least one other firm involved with virtual currency trading has registered with the SEC as a brokerage firm. Templum LLC operates a licensed brokerage firm and alternative trading system and plans to offer startups a platform for selling regulated tokens as well as a market for trading them. Templum has asked the SEC to allow tokens that were issued and traded illegally to “remediate” their status by making the required filings with the SEC. 7.U.S. 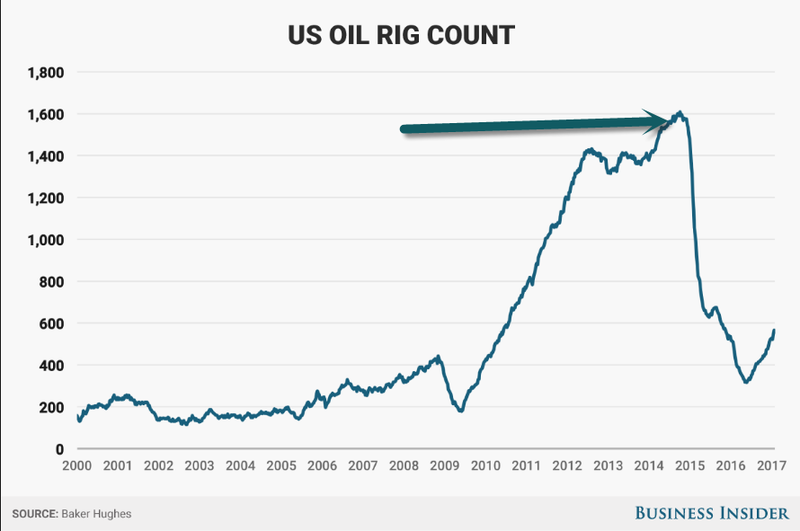 Oil Rig Count Still 1000 Below 2 Years Ago. Customers sit in a plaza area outside the Apple Inc. Michigan Avenue store in Chicago, Illinois. Apple Inc. has gone all-green. The company’s sites worldwide are now completely powered with clean energy, according to a statement Monday. That comprises retail stores, offices, data centers and co-located facilities in 43 countries, and is up from 96 percent reported a year ago. The biggest push has come in the clothing category. With the rapid expansion, the company has silently delivered a message to retailers and brands that have shrugged off its earlier private-label launches as simply tactics that many retailers employ: We’re going big. In fashion, Amazon started out in 2016 with brands like the women’s contemporary line Lark & Ro and the kids clothing label Scout & Ro. But more recently, it has added denim brands like Hale and a sweater collection called Cable Stitch. Retailers typically create their own store brands — at least in part — to hit different price points that outside brands aren’t serving. These brands also typically help boost profits, because retailers can highlight them in their own stores — or on their own virtual shelves — without shelling out big marketing expenses to get them in front of consumers. From email to social media to online dating, we make decisions every day without thinking about it. But many of the choices you arrive at this way aren’t so wise, like staring at a computer all day or refusing to let your partner’s slightly annoying comment go. Just a little thought can help you make better decisions, and have better days. Even smart people can make terrible decisions. Generally, it’s not because they spent time deliberating and somehow arrived at the wrong answer. It’s because they didn’t spend any time thinking at all. For example: You might automatically keep your phone on your desk at work, or grab a smoothie as a go-to “healthy” snack. But these aren’t the wisest choices you could make. Below, we’ve listed some of the easiest traps to fall into, at the office and at home. Some researchers say willpower decreases as the day goes on, so it makes sense to work on tasks that require lots of focus and concentration in the morning. Others disagree that willpower is a finite resource. If nothing else, it makes practical sense to start with the hardest tasks, since you never know what scheduling conflicts will pop up later on. The siren call of your inbox can be hard to resist. Yet research suggests that switching between tasks — say, doing research and checking for new email — takes up to 40% longerthan doing one at a time. Even when you think you’re being more productive by multitasking, you’re probably not. One simple solution, from psychologist Ron Friedman, is to silence your phone so you don’t receive email alerts or to close your email tab while you’re working on something important. Designate specific times to check and respond to email in batches. Turning your phone on “vibrate” isn’t enough. Actually, turning your phone off isn’t even enough. Research published in the Journal of the Association for Consumer Research suggests that the mere presence of your cell phone nearby can hurt your cognitive performance — even if you’re unaware of its influence. The best solution appears to be keeping your phone in another room entirely. Office jobs aren’t exactly conducive to getting a lot of physical activity. But you don’t need to be up and about for hours at a time. A growing body of research suggests that even if you get up and move around for a few minutes several times a day, you’re improving your overall health. Recent research, published in the Journal of the American Heart Association and cited by The New York Times, found that people who were active for a total of about an hour a day had half the mortality risk of people who didn’t. And it didn’t matter whether they were active in 5-minute increments or in longer chunks. Staring at a computer all day can lead to “digital eye strain,” resulting in symptoms like dryness and blurryness, Business Insider’s Erin Brodwin reported. Enter the 20-20-20 rule: Every 20 minutes, look at something 20 feet away for at least 20 seconds, Rahul Khurana, the clinical spokesman for the American Academy of Ophthalmologists told Business Insider’s Kevin Loria. Take that break mid-morning instead. A 2015 study published in the Journal of Applied Psychology suggests that the more time that’s passed since the beginning of the workday, the less useful a break is. Breaks taken earlier in the day are more likely to replenish resources, including energy, concentration, and motivation. Interestingly, that same study found you don’t necessarily have to engage in non-work-related activities during a break. Just make sure you’re doing something that you like to do and you choose to do. In other words, making some headway on a work project you’re excited about could be even more restorative than browsing social media. You might feel more productive when you listen to music while doing focused work — but you’re probably not really. In 2015, I spoke with neuroscientist and musician Daniel Levitin, who cited a growing body of research suggesting that, in almost every case, your performance on intellectual tasks (think reading or writing) suffers considerably when you listen to music. The exception is when you’re performing tasks that are repetitive or monotonous, such as when you’re working on an assembly line or driving for long periods of time. In that case, listening to music can perk you up. Levitin said that a better bet is to listen to music for about 10 to 15 minutes before you start doing focused work, which can put you in a better mood and relax you. Don’t believe the hype — know the facts about your food. Business Insider’s Erin Brodwin put together a list of foods that you think are good for you, but aren’t and foods that you think are bad for you, but aren’t really. For example, bottled juices and fast-casual smoothies might seem nutritious, when in fact they’re generally loaded with sugar and calories. Meanwhile, many people think eating eggs will lead to high cholesterol, but that’s not true for most of us. Scientists say there are two different ways to use Facebook: passive and active. Active use involves direct exchanges with others. Think posting status updates and commenting on other people’s posts. Passive use is about consuming information, like by scrolling through your newsfeed. Most of the time, we use Facebook passively. Yet a study published in the Journal of Experimental Psychology: General suggests that passive Facebook use can make us feel worse. That’s possibly because we feel jealous of everyone’s (seemingly) glamorous lives that they’re broadcasting publicly. So instead of merely browsing, consider sending a message to an old friend or commenting on someone’s happy family photo. When your partner makes a snide comment, it’s all too easy to fire back with something cruel and hurtful. Try to curb that impulse. Marriage and family therapist Hal Runkel previously told Business Insider that the most powerful word to defuse a conflict is “ouch.” You’re expressing vulnerability instead of putting up defenses, while encouraging your partner to do the same. Meanwhile, couples therapist Esther Perel previously told Business Insider that one way to de-escalate a conflict is to reflect back what your partner is saying and show some empathy. Tell your partner that you understand where they’re coming from — even if you don’t yet. Online dating doesn’t have to be a game of speed: racking up as many matches as you can in as little time as possible. Fisher added that “the brain is not well built to choose between hundreds or thousands of alternatives.” She advises people to stop when they’ve hit nine matches and consider those. For example, you keep watching one episode after another of a not-that-interesting TV show. This isn’t just silly — it can be dangerous. As Business Insider previously reported, in some cases sleep loss can be just as deadly as smoking. Turn off the TV and get ready for bed. You’ll be grateful tomorrow, and years later.